The unilateral ceasefire during the holy month of Ramzan may have brought a halt to anti-militancy operations in Kashmir but security agencies have warned of a rise in recruitment of local youths into terrorist groups, that has crossed 80, and a rise in infiltration from various sides of the Line of Control. 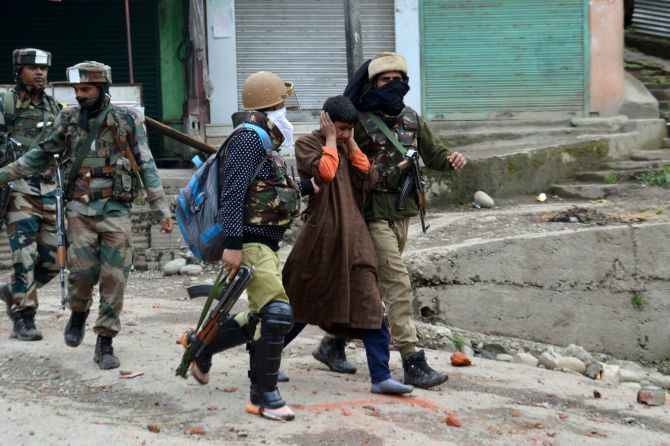 The security agency officials said the highly-volatile Shopian and Pulwama districts in South Kashmir continued to contribute more youths to the militant groups which included outfits like Islamic State-Kashmir and Ansar Ghazwat-ul-Hind, a group which claims support of the Al Qaeda. As many as 20 more youths have joined the terrorist groups in the month of May which included Rouf from Ganderbal, a fourth-semester student pursuing a diploma course in government polytechnic, the officials said. A Unani doctor, the brother of Indian Police Services officer Inamulhaq Mengnoo, has also been reported missing from Shopian and it is apprehended that he too may have joined terror groups, they said, adding that the figure at the end of April this year was 45. The officials said infiltration was also picking up and some of the terrorists had managed to sneak in from Poonch and Rajouri district of Jammu region as well as from the Line of Control in the Kashmir Valley. This created a more alarming situation for the security forces which were readying themselves for the two-month long Amarnath Yatra beginning this month-end. Year 2018, according to the officials, may end up as the worst year in terms of number of youths joining various militant groups as the figures indicated that 81 youths had joined until May this year. In 2017, a total of 126 youths had picked up guns. It was the highest number since 2010, according to a recent data presented in the state assembly and Parliament. There has been a steady rise in the number of youth taking up arms in the Valley since 2014 onwards as compared to 2010-2013 when figures stood at 54, 23, 21 and 6 in the respective years. This year's recruitment of youth joining militancy includes Junaid Ashraf Sehrai, 26, an MBA degree holder from Kashmir University, and son of Mohammed Ashraf Sehrai, who took over as chairman of Tehrek-e-Hurriyat from Syed Ali Shah Geelani. Teherik-e-Hurriyat is a pro-Pakistan amalgam of separatists groups. 'It therefore become imperative for the state to deconstruct why, while militants are being killed, militancy continues to rise,' the report had said. The report said the situation is such that terrorists encounters 'have turned into a spectacle in the recent years with attacks on encounter sites by protesters followed by glamourised funerals'. "The entire phenomenon has had a tendency to create an emotionally charged environment which is ideal for recruiting fresh cadres," it said. The report, while drawing a correlation between the militants killed in encounters and the new recruitment, said, "It has been found that encounters of local militants are part of a vicious circle that acts as a catalyst to push further recruitment." "Large glorified funerals of militants have also been witnessing presence of active militants who give gun salutes to their killed associate. "The presence of militants in these funerals not only eulogises the deaths of militants but at the same time brings the active militants into open interaction with civilians," the report said, warning that such an interaction was one of the important steps in facilitating recruitment.